Phoenix, AZ – This morning, the Arizona Board of Executive Clemency unanimously voted that Arizona Justice Project client Eddie Collins be released and return home after serving more than 43 years in prison. Collins, who has been an Arizona Justice Project client for 12 years, was serving time for a 1973 felony murder conviction. Collins’ brother was the actual shooter and, pursuant to a plea agreement, served only 10 years for the crime. Arizona Justice Project attorneys asked for an absolute discharge, or in the alternative, parole for Collins. The Board did not vote for absolute discharge but granted Collins’ release on home arrest. After six months, Collins may return to the board to ask for parole or absolute discharge. Collins was convicted under Arizona’s 1956 criminal code which made him ineligible for parole. The Arizona Justice Project worked with the Pima County Conviction Integrity Unit in an effort to correct a manifest injustice. Prosecutor Rick Unklesbay, head of the Unit, reviewed the case and agreed to a re-sentencing for Collins which made Collins parole eligible and gave him an opportunity to return home. Mr. Unklesbay spoke on Collins’ behalf at the hearing last May in support of Collins’ release. The BOEC hearing room had standing room only as it was packed with dozens of Collins’ supportive family members, longtime friends, and Arizona Justice Project attorneys and interns. By phone, Collins’ supporters included the surviving victim, Collins’ pastor and mentor, and out-of-state family members. Notably, Eddie’s sister made a powerful presentation about her unwavering support for Eddie and the power of forgiveness. Arizona Justice Project attorneys Katie Puzauskas and Kindra Helferich and University of Arizona law professor Andy Silverman represented Collins at the hearing. Additionally, Arizona Justice Project Re-Entry Team from the ASU School of Social Work – Graham Reilly, Husein Lateef, Shira Zias, and Rachel Williams – have set up a re-entry plan for Collins which was presented to the Board. Since 1998, The Arizona Justice Project has been working to prevent and overturn wrongful convictions in the State of Arizona. 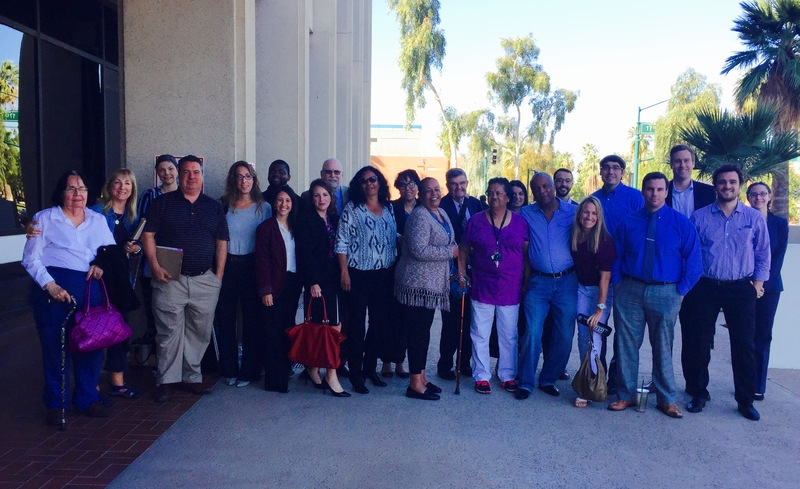 The Arizona Justice Project, housed at the Beus Center for Law & Society, has helped launch legal clinics at the ASU and UofA law schools where law students review and investigate claims of wrongful conviction. The Arizona Justice Project receives approximately 350 new requests for help each year from Arizona inmates. The small staff and dedicated volunteers provide the last resource for many people seeking relief from a wrongful conviction or a manifest injustice. Lab director’s criminal record uncovered; what does it mean?